Set of four porcelain salad plates 8.25" diameter, each Unlimited edition Individually boxed in custom gift box Each of the designs from this set of four porcelain salad plates features a detail from one of Andy Warhol's famous flowers paintings. 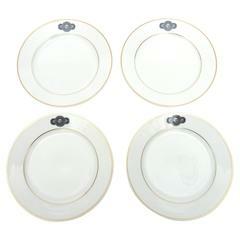 Keep as a set or break up the set for easy gifting as each plate is individually boxed. The plates are dishwasher and microwave safe. 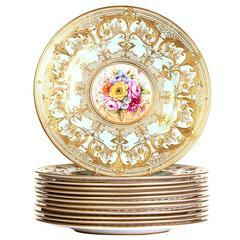 Set of 12 Porcelain 10 inch plates. Bright multicolored floral Primavera pattern. All plates are marked. Made by Heinrich Germany.